Diran Apelian, WPI’s 2018 Innovator of the Year, is known internationally for his research on metal processing and for founding the Metal Processing Institute at WPI. In recent years his research interests have turned to resource recycling and recovery. Worcester Polytechnic Institute (WPI) will present its 2018 Innovator of the Year Award to Diran Apelian, Alcoa-Howmet Professor of Mechanical Engineering and founding director of the university’s Metal Processing Institute (MPI). An internationally recognized authority on metallurgy and recycling, a member of the National Academy of Engineering, and a fellow of the National Academy of Inventors, he is the first WPI faculty member to receive the honor. The award, launched in 2011 to recognize graduates and friends of the university who have demonstrated exemplary accomplishments as innovators, will be presented on Thursday, Nov. 1, at 5 p.m. in a ceremony in Alden Memorial. It will include an address by Apelian, who is the seventh recipient of the award. Previous honorees are James P. Baum ’86, David P. Norton ’62, Robert L. Diamond ’56, Mark O’Neil ’80, Jeremy Hitchcock ’04, and Kathy Loftus ’86. Apelian is known internationally for his research in molten metal processing, plasma processing, shape and spray casting, and the development of new aluminum alloys. 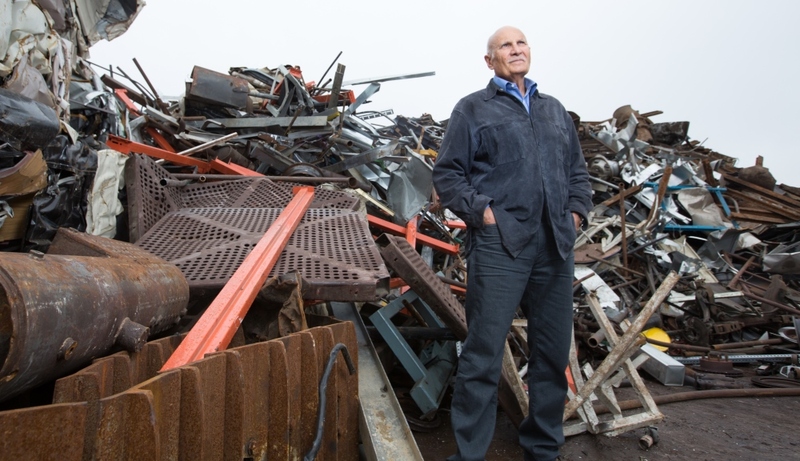 In recent years he has become especially interested in the fate of the many metals and other materials that go into manufactured products but are never reused. In 2010, with support from the National Science Foundation, he co-founded the Center for Resource Recovery and Recycling (CR3), an international research consortium that develops advanced technologies for recovering, recycling, and reusing materials throughout the manufacturing process. This work led to recognition by the Audubon Society, which presented Apelian with its Joan Hodges Queneau Palladium Medal in 2015. CR3 is part of the Metal Processing Institute (MPI), which Apelian founded in 1996. The largest industry-university alliance in North America, MPI is dedicated to advancing the field of materials processing through research in the areas of metal casting, heat treating, and transient materials property data, in addition to resource recovery and recycling. Apelian’s own research has resulted in more than 700 publications, 20 patents, and 11 books, which he co-edited. The research has also set the foundations for five companies that he founded with colleagues and students: Materials Strategies LLC, Battery Resourcers Inc., Melt Cognition LLC, Solvus Global LLC, and Kinetic Batteries LLC. A longtime advocate for redefining engineering education and changing the popular perception of engineers, he is co-editor of Shaping Our World: Engineering Education for the 21st Century (2011, J. Wiley & Sons). In addition to the Palladium Medal, Apelian has received numerous honors for his contributions to research and education in materials science and engineering, including induction into the National Academy of Engineering in 2009. He was one of four recipients of the 2016 Bernard M. Gordon Prize for Innovation in Engineering and Technology Education, which honored WPI’s contributions to engineering education through the WPI Plan. (The other recipients were Arthur Heinricher, dean of undergraduate studies; Richard Vaz, director of WPI’s Center for Project-Based Learning, and Kristin Wobbe, associate dean of undergraduate studies.) He serves on several technical, corporate, and editorial boards. Born in Egypt to Armenian parents, he co-founded WPI’s Armenia Project Center in 2017. Apelian’s other honors include the 2010 Robert Earll McConnell Award from the American Institute of Mining, Metallurgical, and Petroleum Engineers (AIME), and the Acta Materialia Inc. J. Herbert Hollomon Award, the Brimacombe Prize, and the Bruce Chalmers Award from The Minerals, Metals & Materials Society (TMS), one of the four AIME member societies. In 2017 he was named a fellow of the National Academy of Inventors, the highest professional accolade bestowed solely upon academic inventors. He served as the 52nd president of TMS and was one of six Anniversary Laureates at the TMS annual meeting in 2007, the society's 50th anniversary year. He is one of only 100 living TMS Fellows and was the first person from WPI to be named a fellow of APMI International, the professional society for individuals involved in powder metallurgy technology and particulate materials. He served as chair of the ASM Educational Foundation Board of Trustees from 2016 to 2018. He is also an honorary member of the French Materials Engineering Society, a fellow of ASM International, and a foreign member of the National Academy of Sciences of the Republic of Armenia. He received an honorary doctorate from Northwestern Polytechnic University in Xian, China, in 1997. Apelian received an undergraduate degree in metallurgical engineering from Drexel University and an Sc.D. in materials science from MIT. He worked at Bethlehem Steel's Homer Research Laboratories and then joined Drexel, where he ultimately was named vice provost. At WPI he served as university provost from 1990 to 1996. Since then, he has focused on teaching and research in materials processing. WPI honored him in 2006 with its Board of Trustees' Award for Outstanding Research and Creative Scholarship and in 2009 with its Chairman's Exemplary Faculty Prize.